Here Be Lions is a ministry collective focused on discipleship music and community. The worship team led by Dustin Smith ("God Who Moves The Mountains " "Miracles") aims to create music that welcomes the power and presence of God in expectation of a supernatural move of the Father to bring salvation healing and restoration. 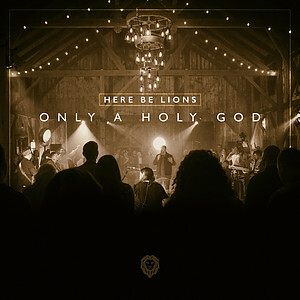 For their 11-track label debut Only A Holy God Here Be Lions delivers songs of reverence and praise written around the character of God and the forgiveness and wholeness found in Jesus. Writers include Dustin Smith members of the HBL team and guest writers Stu G (Delirious?) Joshua Silverberg (The Belonging) Chris Quilala (Jesus Culture) and Jacob Sooter (Bethel). The collective takes its name from the old mapping tradition in which explorers marked unknown dangerous territory with a symbol and the phrase "Here Be Lions." Originally meant as a warning the phrase has become a call for the Here Be Lions collective to advance God's kingdom authority and order. Only A Holy God by Here Be Lions was published by Integrity Music in June 2018 and is our 5844th best seller. The ISBN for Only A Holy God is 0000768713228. Be the first to review Only A Holy God! Got a question? No problem! Just click here to ask us about Only A Holy God. Now Playing: Wildfire Your browser does not support the audio element.